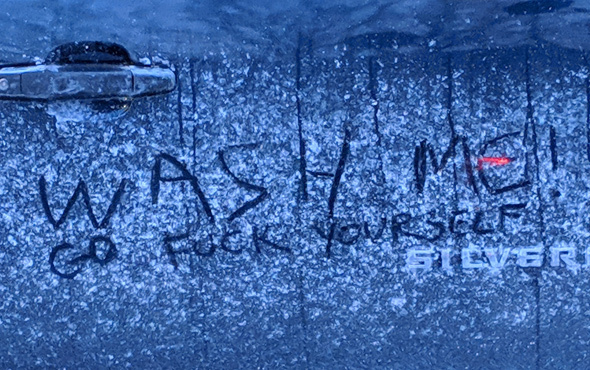 The several gazillion tons of salt public-works crews dumped on Boston streets the other day have turned vehicles into impromptu canvases for messages. As seen on this SUV in Roslindale, not everybody's a fan. Move over buddy! 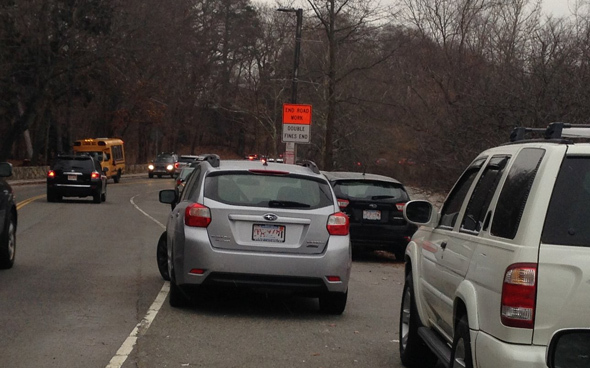 Despite the snow banks having receded to the curb, this lone duck still sits in the middle of the bike lane at Jamaica Pond. The city has noticed and placed several tickets on his windshield. Look at all that snow! 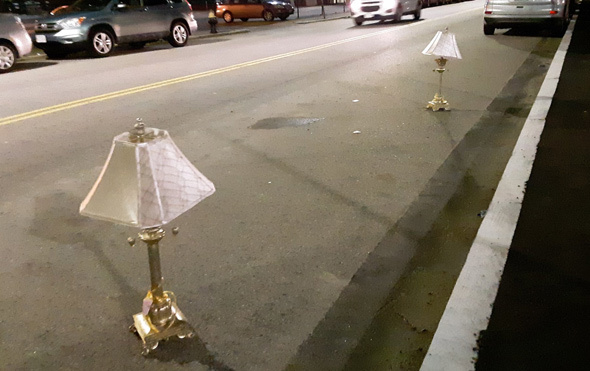 Eileen Murphy ran across these faux French-provincial space savers on West 1st between E and F this evening, should you need something for your living-room end tables. The scene on Princeton Street in East Boston. 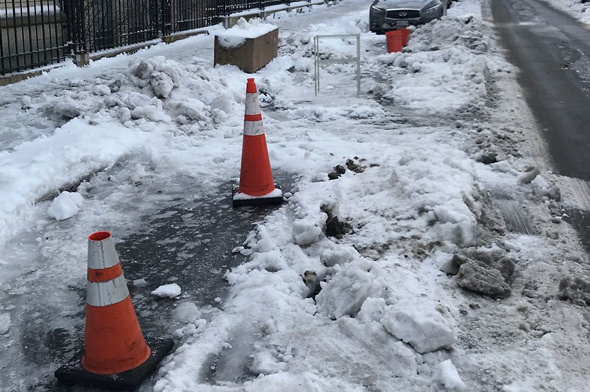 The Boston Public Works Department is responding to a flood of complaints about space savers - from South Boston, East Boston and Dorchester, in particular - with the same answer: Crews will pick up the cones, chairs and other detritus on the streets' regular trash pickup days. Read more. Your basic JP space saving, on Boylston Street in February, 2018. Photo by Spiff. A discussion on spaces savers at Curtis Hall was polite and calm and ultimately roamed, as JP discussions sometimes do, over broader topics - from man's relationship to his fellow man, the growth of anomie in the age of the Internet and the cultural essence of being a Bostonian. Read more. 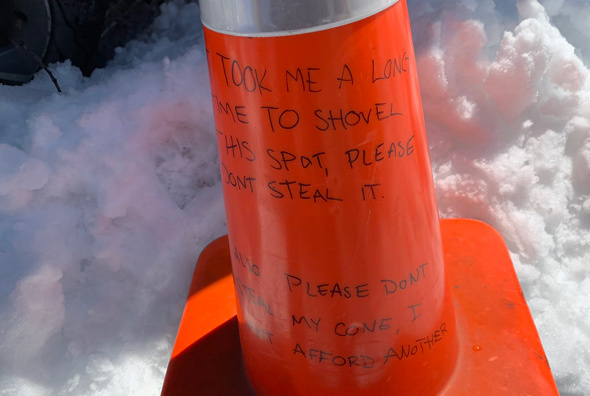 Sure, tomrrow's forecast calls for torrential rain, but a Redlands Road resident knows you can never be too sure and so sets out some space savers just in case, as Megan Piccirillo shows us. 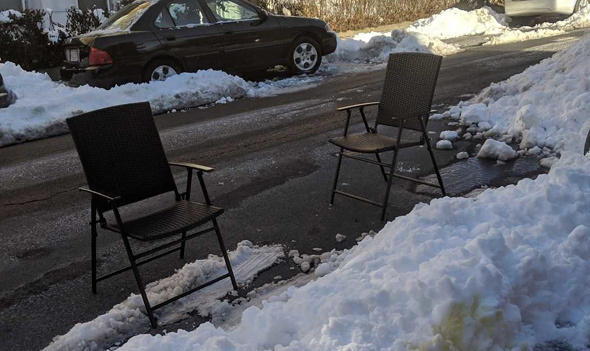 Jamaica Plain, which has rapidly risen to rival South Boston for the boldness, obnoxiousness and inventiveness of its space-saving fervor, could join the South End in trying to ban space saving altogether. Read more. 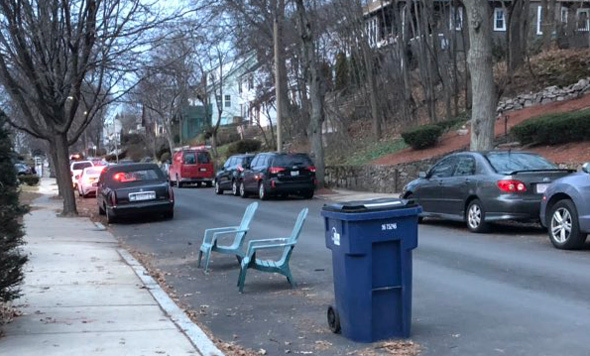 With the entire region hunkering down as the season's first nor'easter churns up the coast to slam us upside the head with nature's fury, Molly the Roving UHub photographer spotted an early space saver on Philbrick Street in Roslindale this morning. 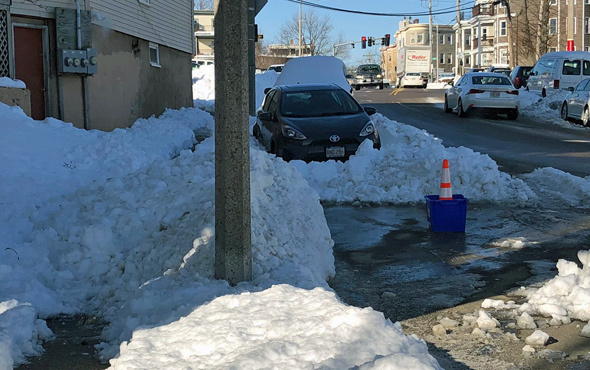 The East Boston Times reports on Webster Street, where residents were startled to see the city change that recently to allow overnight parking on weekends for non-residents and two-hour parking during weekdays. With the help of City Councilor Lydia Edwards, that didn't last long.